Sleek marble. Warm toned granite and quartz. 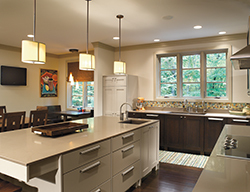 No matter your style and taste, we have a tremendous variety of stone countertops to complete your cabinetry design. Beautiful selections are available at both of our showrooms. However, when you visit our Monroe location, alongside our sister store House of Stone, you are among yards and yards of the finest slabs from across the globe. There are over 60 different types of stone and 100+ samples of premium granite, such as classic Italian marble and exotic Brazilian choices. From template to install, the focus is on skilled precision. 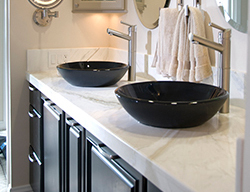 House of Stone combines the latest technology with hand-craftsmanship for each and every countertop. Their outstanding artisans and personable customer service truly sets them apart. This winning combination has resulted in the company being featured in Stone World magazine and the countertop choice for countless builders, contractors, architects, interior designers and celebrities. 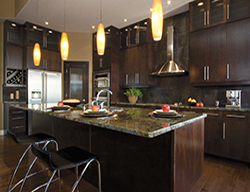 R & S Cabinet Brokers – THE source for countertops in the Rockland County NY and Orange County NY area, including the towns of Nyack, Nanuet, Spring Valley, Pearl River, Montebello, Piermont, Suffern, Orangetown, Tappan, Spark Hill, Haverstraw, Monroe, Woodbury, Warwick, Chester, Goshen, Washingtonville, Middletown, Minisink, Slate Hill, Campbell Hall New York (NY).